Although reform is sorely needed, EU politicians seem to be lost in settling on a common course for the future. One key guiding framework for the debate is already available: the United Nations’ global Sustainable Development Goals (SDGs), which set out a broad range of objectives for 2030. The European Union has committed to achieving these goals, which do provide the potential to serve as a guiding principle in the discussion about the Unions’ future. More than three years after their adoption by the United Nations in 2015, the process of implementing this extensive agenda at EU level remains largely neglected. As a first step, the European Commission announced a reflection paper explaining how it would like to work towards the 17 global goals at EU level. The challenge though lies in ensuring that the paper has an impact beyond the ‘sustainable development community’. Harmonisation with existing political processes is indispensable. 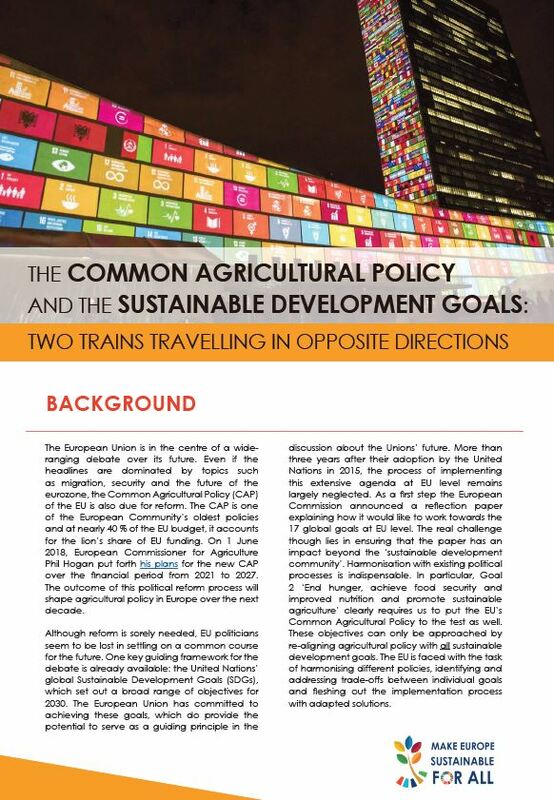 In particular, Goal 2 ‘End hunger, achieve food security and improved nutrition and promote sustainable agriculture’ clearly requires us to put the EU’s Common Agricultural Policy to the test as well. These objectives can only be approached by re-aligning agricultural policy with all sustainable development goals. The EU is faced with the task of harmonising different policies, identifying and addressing trade-offs between individual goals and fleshing out the implementation process with adapted solutions.